XMLdation Studio was developed so that experts may maintain XML business rules and test files easily. Maintaining business rules and test files in Studio ensures in several beneficial products for Studio expert. Users of XMLdation's validation service may access the maintained rules and validate their own XML files against them. In addition, Studio provides documentation on the maintained business rules which can be handed to people who are creating XML-files. With test file creation you can manage large sets of test files with variating content and up-to-date timestamps and unique identifiers together with large files for performance testing. The language supported and generated in Studio is OCL, which is has its own wiki section in user guide for OCL. After getting in you can start creating content. More about that and links to different guides below. Main thing to work with in Studio are projects. The projects can be grouped. 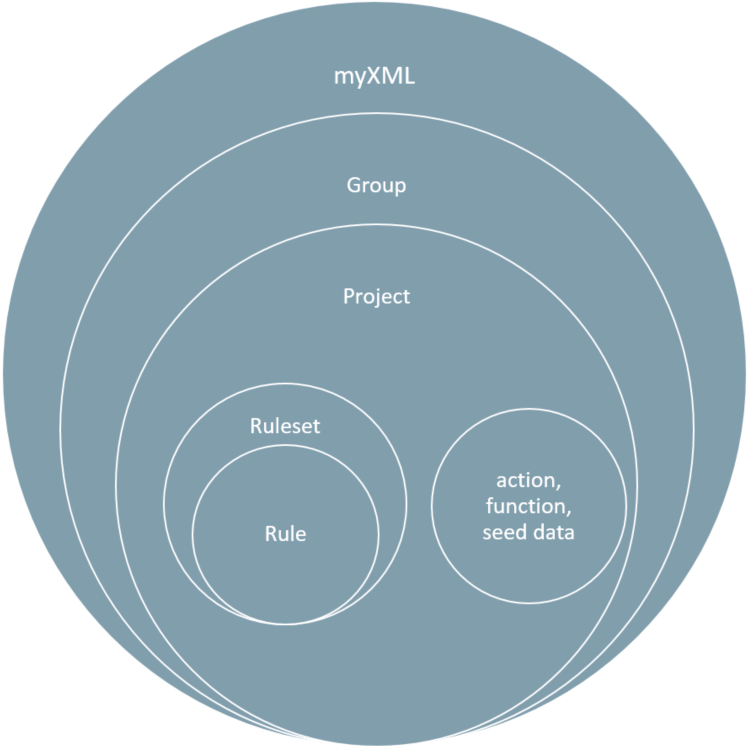 The projects can contain (business) rules in rulesets and actions, functions and seed data for producing test files. The hierarchy is illustrated below.